You can of course combine two (or more) themes into one - robots and games console could be easily combined, as could surf dude and, under the sea. 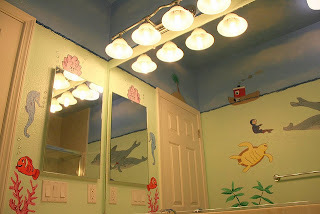 The quickest way to imprint a theme onto a bathroom is on the walls. Murals are easier to create than you may think. A faux painted clouds and sky design, is a good place to start for most themes (either on the walls or ceiling). From there you can add details to make your kid's bathroom unique. Make sure to use paints specifically for bathroom and kitchens, as obviously this room has to put up with a great deal of moisture, humidity, and plenty of splashes too. Smaller details to establish the theme can simply be painted on, either freehand, or by penciling in outlines for the larger features. If you are constrained by time, or artistic talent, then shop-bought motifs can be easily incorporated onto your background. To prevent these motifs (vinyl wall decals, or stickers) from peeling off the walls, secure with strong wallpaper paste and use a clear varnish over the top to seal them. A kid's bathroom needs a few finishing touches to underline the overall theme. It's a good idea to put toys on display that tie in with the theme such as squeezy pirates that squirt water, wind-up fish toys, and of course rubber ducks. Towels with motifs, and even kids toiletries, can be used as display items. 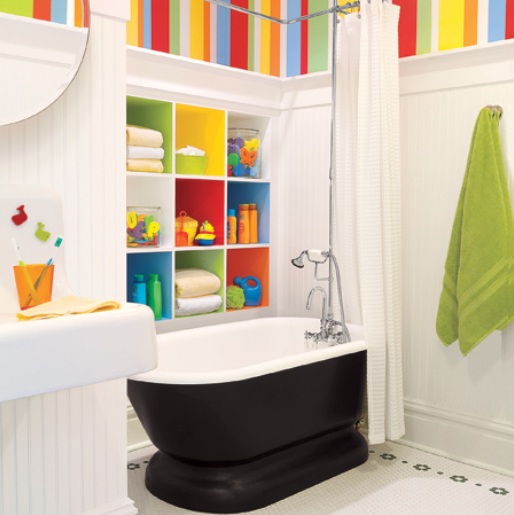 The use of water-soluble crayons can be used to keep bath-time fun. Obviously make sure the children are surrounded by wipe-off surfaces - you don't want any crayon on tile grouting or even worse, your beautiful wall mural. A whiteboard attached to the bath-side makes a cute addition, which shows the kids that this is the place for artwork to take place. Bathtime can also be made educational, as well as fun, by using foam letters and numbers that stick to the bath and tiles when they are wet. Get them to leave cute messages for each other, or spell out their name. 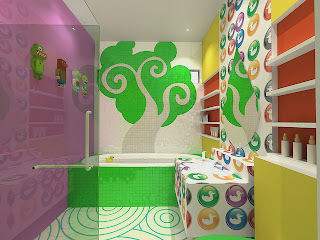 Older kid's bathroom ideas, are more difficult to come by, but are not impossible to achieve. Older children may be at home with a more grown-up theme like pirates, games console, and surf dude, but if you have a number of kids of different ages to keep happy, then keep the theme more neutral. Mosaic tile patterns are a good way to do this, whilst still allowing you freedom for some creative expression. This also means you can use bright primary colors, but control to what degree to keep it from being overbearing. 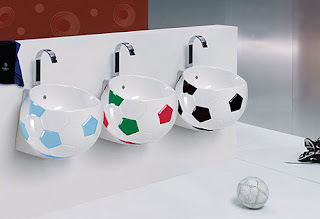 Water splash motifs, geometric shapes, fun mirrors, funky tap designs and storage, will make the room feel a bit more grown up, whilst still keeping younger members happy too. Nothing makes bath-time more fun than bath toys but they soon mount up. Bath-side storage, such as nets that attach to the tiles with suckers, allows them to get out and put toys away themselves. Other storage ideas that work well are, chrome corner units that allow toys and washcloths to dry off, or use a plain wooden storage box to keep on the floor. If you paint over it, you can then decorate it further by incorporating a motif from your theme. A stylish, heated towel rail is an excellent feature to include in a kid's bathroom. Not only does it look good, it also offers much more room for drying off numerous towels in one go, than a conventional radiator. 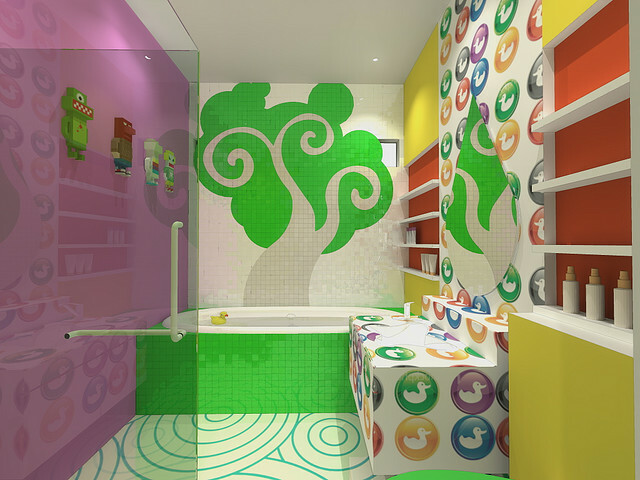 Keep these practical considerations in mind, and along with your kid's bathroom ideas, theme, and imagination you will be able to create a child's bathroom with style.